The lovingly furnished apartment "Vilmblick" (DG) with a developed loft, has a spacious and maritime furnished living area with inviting bats for an extraordinary panoramic view for up to four people. The beautiful kitchen in the country house style is equipped with high quality brand appliances. A large dining table offers space for cozy evenings with a wide view to the island of Vilm. The two sleeping areas are equipped with double beds and flat-screen TVs. The particularly cozy sleeping area in the loft can be reached via a staircase from the living room. The open ceiling in the living area with exposed beams is the highlight of this apartment. The luxuriously appointed bathroom with large walk-in rain shower includes a large bathtub and ample space. The non-bathroom toilet is separately accessible from both sleeping areas. Free internet access (W-Lan) is available via hotspot. Ample parking is also reserved directly at the property. The "Landhaus Gager", with two apartments "Boddenblick" & "Vilmblick" in real Rügener charm and with sea view (Hagensche Wieck) is located on the peninsula Mönchgut, in the midst of the old 400 soul fishing village "Gager" with attached marina. 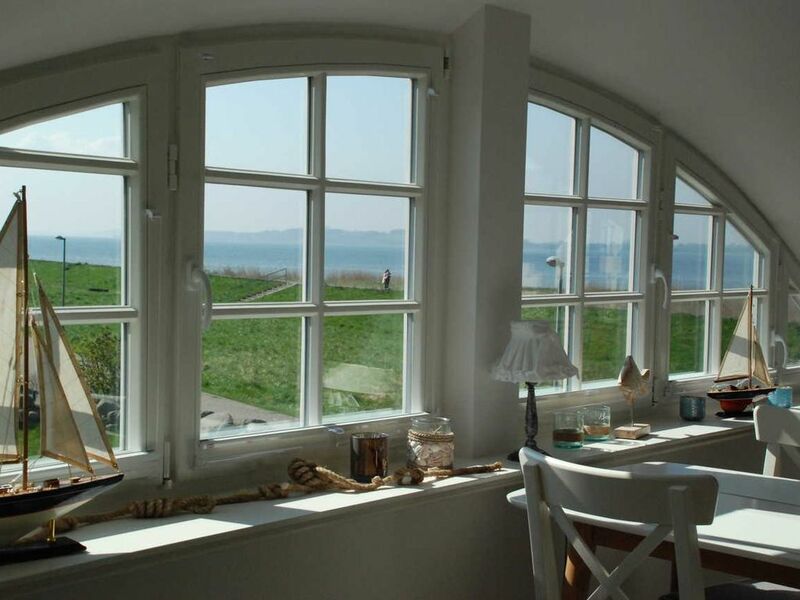 Both apartments offer a stunning view, over to the castle Granitz, passing ships, to the island of Vilm in the great Greifswalder Bodden open to the wide Baltic Sea. The house was newly built in maritime style 2017 and is very tastefully decorated. The marina and water is within walking distance of the house. Evening walks through the harbor or the biosphere reserve round off your stay in the most beautiful area of Ruegen, - The apartment (ground floor) "Boddenblick" can accommodate up to 4 people - The apartment (DG) "Vilmblick" can accommodate up to 4 people - Free internet access (W-Lan) is available via hotspot - Free parking are reserved for you directly at the house - pets are not allowed Details on arrival and key handover you will receive with the booking confirmation. We are looking forward to your visit! Gager aber nicht gager geworden!!! Toll!! Die Wohnung & Ausblick sind super. Umgebung toll & abwechslungsreich, trotzdem ruhig. Einkaufsmöglichkeiten in ca. 7 km ausreichend vorhanden. Wir kommen gern wieder. An der Unterkunft gibt es nichts auszusetzen, einfach toll, würden jederzeit wieder buchen. Vielen Dank! The "Landhaus Gager" is located very close to the marina in the romantic fishing village "Gager", which extends between the "Hagensche Wieck" and the "Zicherschen Alpen" (mountains) in the south.